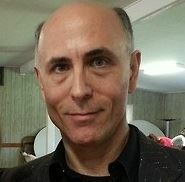 David Gaines (a.k.a. Dave The Karaoke Guy) is a classically trained musician with over 35 years of experience in all aspects of music and audio. An assistant organizer for the Karaoke All-Stars Meetup group based in Montgomery County, he has been hosting karaoke with his unique blend of humor, encouragement, and friendly banter at private events around the Washington/Baltimore area since 2009. Dave was formerly the weekly KJ at the Uptown Tap House in Washington, D.C.’s Cleveland Park neighborhood and is now the KJ for The Sign Of The Whale DC's weekly karaoke night. Large or small, indoors or outdoors, formal or informal - karaoke adds uniquely memorable fun to any event. Dave has either been a karaoke DJ or provided machine rentals at venues ranging from a home basement rec room to a backyard birthday party to nightclub dance floors to a Baltimore Hilton main ballroom. Dave brings the equipment you need, a huge variety of songs, and a big smile - you bring the voices! A Dave The Karaoke Guy show or system rental will make you and your family, friends or colleagues the stars at your next event! Three hours of singing to celebrate your birthday, family reunion, office achievement, bar/bat mitzvah, anniversary, or any other very special occasion: karaoke-style! Dave The Karaoke Guy will run the show with humor and enthusiasm and keep you and your guests stepping up to the microphone. A party filled with musical participation that everyone will enjoy and remember......with YOU as the star entertainers! This package includes all the necessary karaoke and audio equipment with thousands of songs from all eras and styles from which to choose; delivery, setup, and loadout; and four hours of karaoke with Dave as your M.C. 1. CLIENT must ensure that the venue is suitable for VENDOR’s performance. CLIENT or the venue rented/hired by CLIENT must provide a safe and adequate source of power suitable for VENDOR’s sound system. 2. CLIENT must provide a safe, dry, level performance area of sufficient size to accommodate the performance of VENDOR. If the stage area is outside, the ground where VENDOR will set up must be dry, and adequate cover protecting against direct sunlight and possible precipitation by way of a canopy, tent, awning, etc. must be provided, including side walls if the covering is a tent that is side wall-enabled. 3. If VENDOR is unable to set up or start the show at the agreed-upon time, or is unable to continue the show once started, due to inclement weather, Acts of God or other reasons beyond his control, CLIENT agrees that VENDOR shall not be obliged to extend his performance to make up the time and that the full contract amount shall still be payable as if no delay had taken place. 4. VENDOR will arrive one and a half (1.5) hours prior to the start of the performance in order to load in, set up all equipment, and conduct a sound check, as indicated on page one of this contract, regardless of whether guests are already present at the venue. 5. VENDOR must be able to safely and conveniently dismantle and load-out his equipment immediately following the conclusion of the performance. If VENDOR is unable to breakdown his equipment directly after the performance, or is in any way prevented from dismantling or loading out his equipment, additional fees of $300 per hour will apply. 6. VENDOR requires approximately one (1) hour after the performance to dismantle equipment and conduct the load-out. CLIENT agrees to notify the venue or site manager(s) of this requirement. 7. A deposit is payable in advance in order to reserve and secure the services of VENDOR for the agreed-upon date. CLIENT acknowledges that this deposit is nonrefundable except as indicated below. The deposit must be paid at least ten (10) days prior to the performance date in order to engage the services of VENDOR. CLIENT may pay the deposit by cash, credit card, check or money order payable to “David Gaines,” or via PayPal.com to davidrgaines@gmail.com with the addition of a 4% service charge. VENDOR will only confirm the booking of this engagement upon receipt of the agreed-upon deposit as well as the completed and signed Contract and Terms and Conditions. 8. The balance due must be paid by cash, credit card, or check/money order payable to “David Gaines” at the start of the event and before the performance begins. CLIENT acknowledges that VENDOR reserves the right not to proceed with the show until full payment has been made. 9. In the event of a cancellation by CLIENT within seven (7) days of the performance date, CLIENT agrees to be liable for a cancellation fee of 50% of the balance due. 10. In the event of a cancellation by CLIENT within five (5) days of the performance date, CLIENT agrees to be liable for a cancellation fee of 75% of the balance due. 11. In the event of a cancellation by CLIENT within forty-eight (48) hours of the performance date, CLIENT agrees to be liable for 100% of the balance due. 12. VENDOR shall make every effort to perform in accordance with these terms. However, if VENDOR is unable to perform, such inability will not be deemed to be a breach if caused by any legitimate conditions beyond VENDOR's control. If such circumstances should arise, VENDOR will notify CLIENT and make all reasonable efforts to find a replacement. If unable to find one, CLIENT will receive a full deposit refund. Non-performance under these conditions will not constitute a breach of this agreement. Four hours of singing to celebrate your wedding karaoke-style! Dave The Karaoke Guy will run the show with humor and enthusiasm and keep you and your guests stepping up to the microphone. A party filled with musical participation that everyone will enjoy and remember......with YOU as the star entertainers! This package includes all the necessary karaoke and audio equipment with thousands of songs from all eras and styles from which to choose; delivery, setup, and loadout; and four hours of karaoke with Dave as your M.C. This is only a summary of the principal terms included with my standard event contract. The complete list of terms and conditions will be provided with the final contract at booking time. 1. CLIENT must ensure that the venue is suitable for VENDOR’s performance. CLIENT or the venue rented/hired by CLIENT must provide a safe and adequate source of power suitable for VENDOR’s sound system. 2. CLIENT must provide a safe, dry, level performance area of sufficient size to accommodate the performance of VENDOR. If the stage area is outside, the ground where VENDOR will set up must be dry, and adequate cover protecting against direct sunlight and possible precipitation by way of a canopy, tent, awning, etc. must be provided, including side walls if the covering is a tent that is side wall-enabled. 3. If VENDOR is unable to set up or start the show at the agreed-upon time, or is unable to continue the show once started, due to inclement weather, Acts of God or other reasons beyond his control, CLIENT agrees that VENDOR shall not be obliged to extend his performance to make up the time and that the full contract amount shall still be payable as if no delay had taken place. 4. VENDOR will arrive one and a half (1.5) hours prior to the start of the performance in order to load in, set up all equipment, and conduct a sound check, as indicated on page one of this contract, regardless of whether guests are already present at the venue. 5. VENDOR must be able to safely and conveniently dismantle and load-out his equipment immediately following the conclusion of the performance. If VENDOR is unable to breakdown his equipment directly after the performance, or is in any way prevented from dismantling or loading out his equipment, additional fees of $300 per hour will apply. 6. VENDOR requires approximately one (1) hour after the performance to dismantle equipment and conduct the load-out. CLIENT agrees to notify the venue or site manager(s) of this requirement. 7. A deposit is payable in advance in order to reserve and secure the services of VENDOR for the agreed-upon date. CLIENT acknowledges that this deposit is nonrefundable except as indicated below. The deposit must be paid at least ten (10) days prior to the performance date in order to engage the services of VENDOR. CLIENT may pay the deposit by cash, credit card, check or money order payable to “David Gaines,” or via PayPal.com to davidrgaines@gmail.com with the addition of a 4% service charge. VENDOR will only confirm the booking of this engagement upon receipt of the agreed-upon deposit as well as the completed and signed Contract and Terms and Conditions. 8. The balance due must be paid by cash, credit card, or check/money order payable to “David Gaines” at the start of the event and before the performance begins. CLIENT acknowledges that VENDOR reserves the right not to proceed with the show until full payment has been made. 9. In the event of a cancellation by CLIENT within seven (7) days of the performance date, CLIENT agrees to be liable for a cancellation fee of 50% of the balance due. 10. In the event of a cancellation by CLIENT within five (5) days of the performance date, CLIENT agrees to be liable for a cancellation fee of 75% of the balance due. 11. In the event of a cancellation by CLIENT within forty-eight (48) hours of the performance date, CLIENT agrees to be liable for 100% of the balance due. 12. VENDOR shall make every effort to perform in accordance with these terms. However, if VENDOR is unable to perform, such inability will not be deemed to be a breach if caused by any legitimate conditions beyond VENDOR's control. If such circumstances should arise, VENDOR will notify CLIENT and make all reasonable efforts to find a replacement. If unable to find one, CLIENT will receive a full deposit refund. Non-performance under these conditions will not constitute a breach of this agreement.